Added by Indo American News on December 30, 2016. 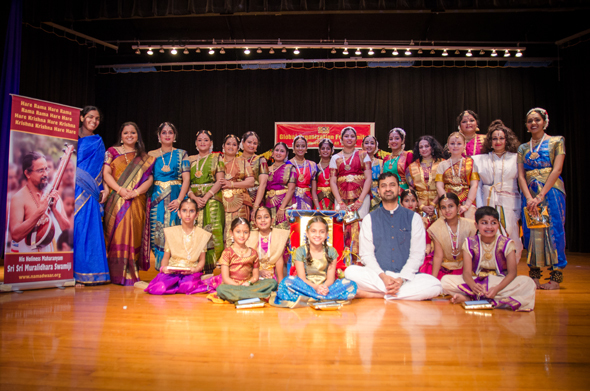 HOUSTON: “Bhakti Sugandham” meaning Devotional Fragrance was an exposition of exquisite music combined with exclusive Bharatanatyam dance. 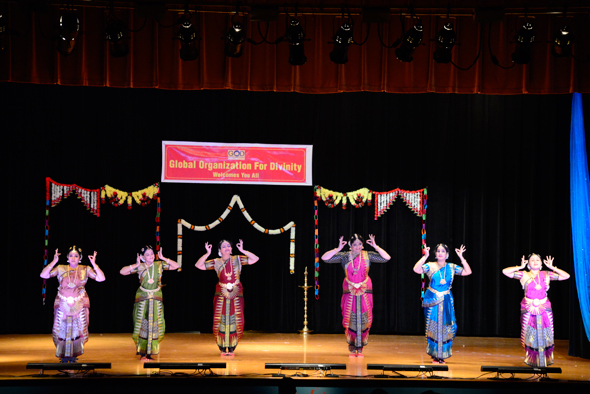 The dance performance was embodied with expressions of nine different emotions called “Nava Rasa” and the Global Organizations of Divinity produced the program with the music compositions created by His Holiness Sri Sri Muralidhara Swamiji. To depict the nine different forms of Rasa or emotion many episodes were taken from Srimad Bhagavatham and woven into expressive performance through narrative Bharatanatyam. The concept being sublime, important extra efforts were contributed by dance choreography of Surabhi Veeraraghavan and exclusive music rendition of Uma Ranganathan. Both the Artistic directors spent a whole year of planning, preparations with creativity and production of phenomenal orchestra accompaniments and costumes. Beginning with the Dhyana Sloka the dance commenced with carrying the Text of Srimad Bhagavatham in a palanquin, as the scripture itself is an embodiment of the deity Lord Krishna. This was followed by soulful poetical tribute to Srimad Bhagavatham. It was interesting to witness how Srimad Bhagavatham originated. “Bhakti Sugandham” dance ballet opened with a group dance of swift Jathis portraying the Nava Rasa content of Courage, Disgust, Anger, Compassion, Humor, Fearfulness, Wonder, Love and Peace that was presented through popular stories taken from Srimad Bhagavatam, the crown jewel of all Indian sacred texts. One can see that Rasa Abhinaya was predominant in all of the nine different emotions. Veeram of Bhishma was well portrayed by his vow of either killing Arjuna or forcing Krishna to pick up a weapon. Bibatsa or disgust was conveyed by the transition of soul passing through the disgusting Vaitrani River. The Anger story was depicted with excellent choreography with fast paced Jathis and the anger of Lord Shiva. The Karunya or Compassion of the Lord Dwarakadheesh and poor classmate Sudama story. Lord Krishna. Hasyam came out of Samudra Manthan, among other things. “Bhayam” or Fear was well depicted from the story of the ferocious Narasimha Avatar. The ingenuity of Surabhi Veeraraghavan who superbly performed as Lord Narasimha presented the posture precisely in Bharatanatyam style. Shobita Arun portrayal of some the wicked personalities in the scripture were laudable. Soujanya Madhusudhan presentation was very authentic Kalakshetra style. The Adbhutam and Shringaram had episodes of Vamana avatar and Bhakti of Gopis of Vrndhavana respectively. The Gopis dancing with vitrtual dandia was remarkable. Shantham was shown as the Eternal Peace by taking us to the tranquility of SriVaikunta where Lord Sriman Narayana reposes along with his consort Sri Mahalakshmi. Other star studded participants were Sandhya Raghuraman, Meenakshi Venkataraman, Divya Koothan, Hema Naren, Jwalanti Prasad, Krishnaya Corbett, Pavithra Chandrasekaran, Radha Venkat, Ratna Ramaraju, Selvi Samy, Shriya Fruitwala, Shruti Natarajan, Usha Prashanth, Varsha Vasu, Zenitha Ram, Advaith Subramanian, Ananya Hariharasudhan, Madhura Sriram, Maithreyi Asthagiri, Maya Shankar, Sahana Thothadri. Each and every one of the dancers brought out the gestures and facial expressions in different episodes that were outstanding. The emcees were Ravi Thottadhri and Malathi Krishnan. Uma Ranganathan melodiously rendered the invocation. Dr. Lekshmi Nair welcomed everyone and gave an introduction about Namadwaar and the activities of Global Organization of Divinity (G.O.D.) Contrary to the norm Vote of thanks was given by Nisha Giri even before the main event began. Nisha was integral part of the production concept and stories that were included. She thanked all who were involved in the production of Bhakti Sugandham. It is believed that there are two easy paths of devotion or Bhakti, which are Shravanam (To hear) and Kirtanam (sing Lord’s Praise). 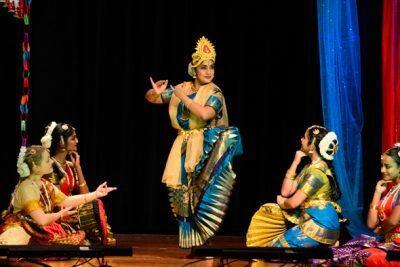 I would add “Natyam” dance as a form of worship as this beautiful dance production of “Bhakti Sugandham” created one such experience.